This post is a continuation of my Winter Rides post and covers mostly short rides I have done in the area. I always take lots of pictures and just like I like to see my readers blogs and pictures, I hope you like to see mine too. 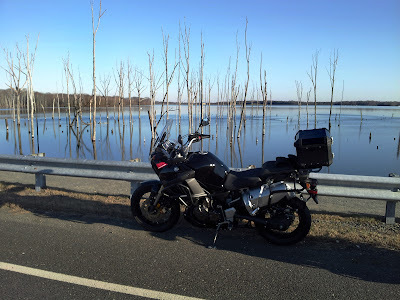 One of the places I like to take a ride late in the afternoon is the Manasquan Reservoir. 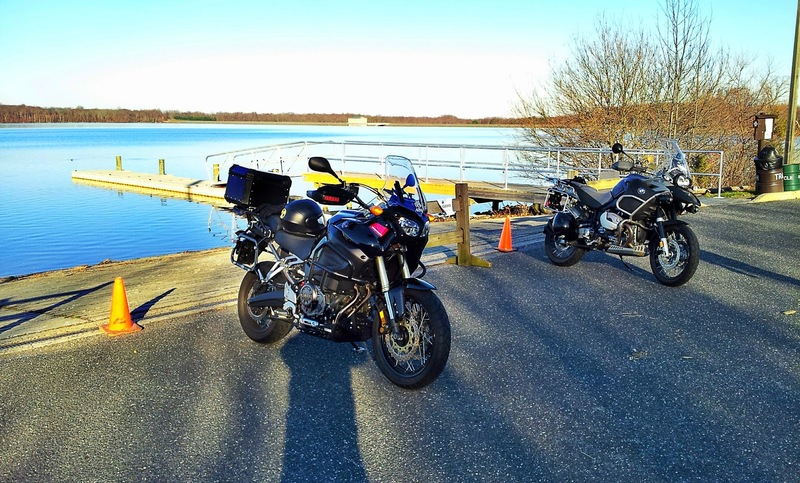 The reservoir is a beautiful park with a 5 mile bicycle and pedestrian path around the lake. I have been there many times with my bicycle and usually do two times around the reservoir. Most of the pictures were taken with my phone, the first with a panorama app I was testing on my Android, didn't do a good job and has since been removed. The second and third were taken with an app that does HDR, thus the strong saturation in the colors. 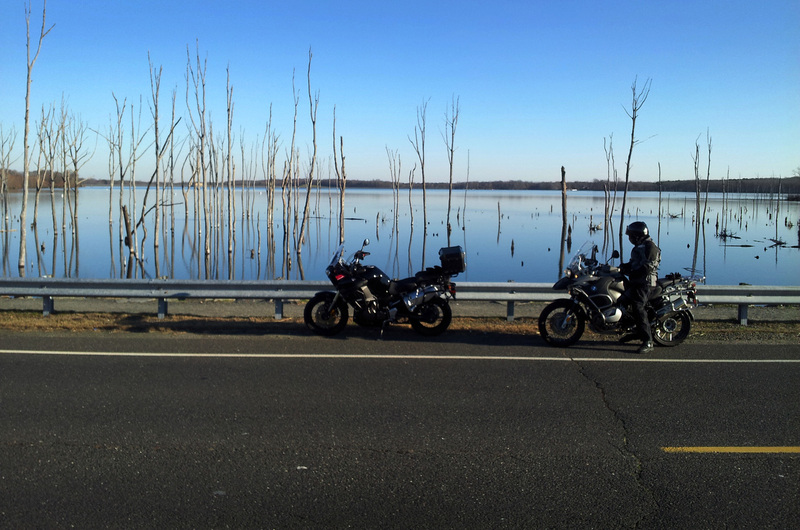 Last December my brother and I stopped by the lake to take pictures and then followed the winding road around the lake. My brother does a lot of waiting for me. These two pictures were taken in the Summer a while ago on a different trip to the park. 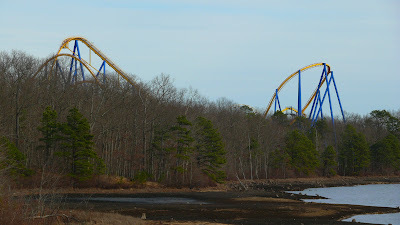 New Jersey has some weird attractions and to cover them we have the Weird NJ Magazine and web site, you can read more here Weird NJ. An issue published a while ago had an article about the upside down car on the side of a major route near where I used to work. I had passed it quite a few times but on this day I stopped to get a picture. 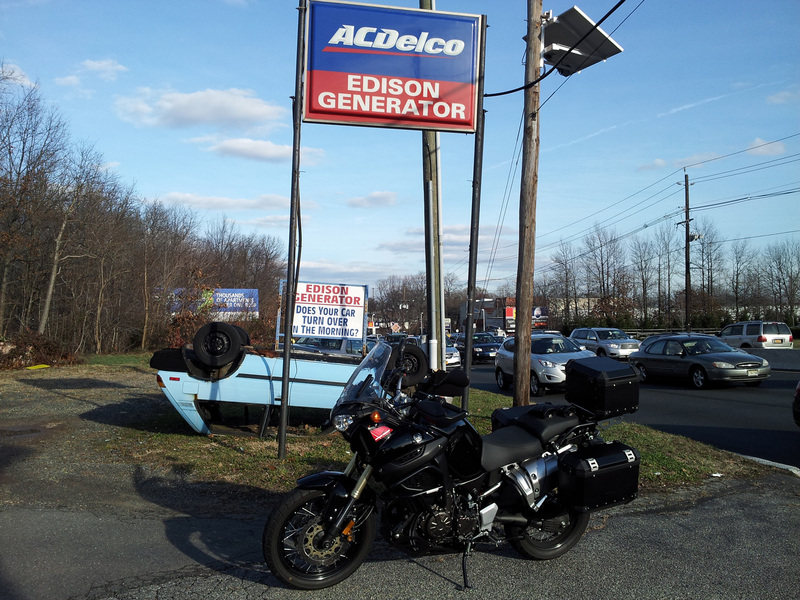 It serves as advertisement for Edison Generator shop, is any car on the road today still using a "generator"? 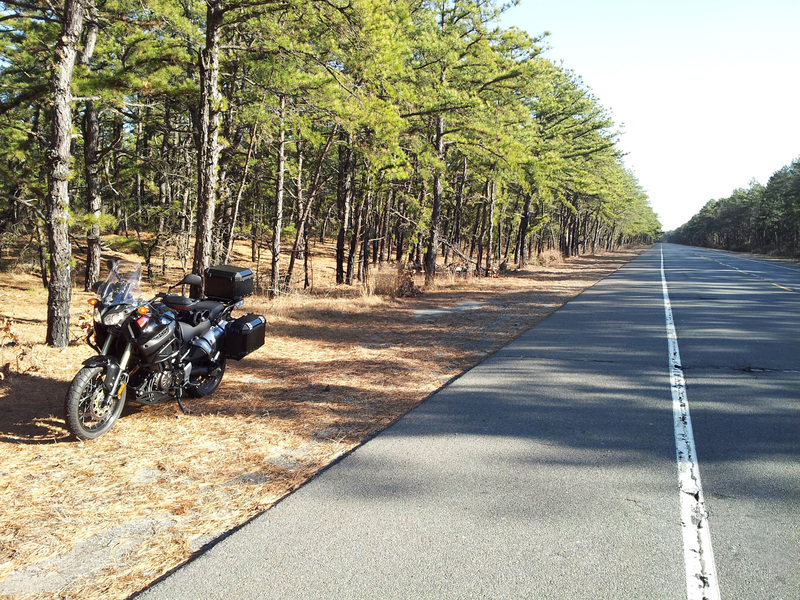 My last ride of the year was on December 31st. 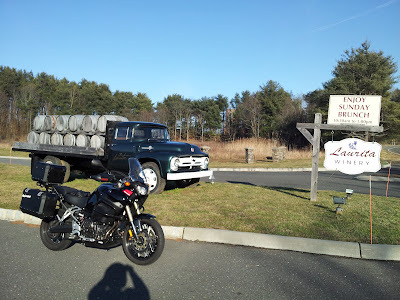 I visited my mom earlier in the day and then rode home late afternoon on County Road 539 which cuts right through the McGuire-Dix-Lakehurst joint base. Did I say NJ was weird? this base is the combination of United States Air Force McGuire Air Force Base, the United States Army Fort Dix and the United States Navy Naval Air Engineering Station Lakehurst, which were merged on 1 October 2009. The base comprises 42,000 acres, you can read more here and see the satellite picture here. 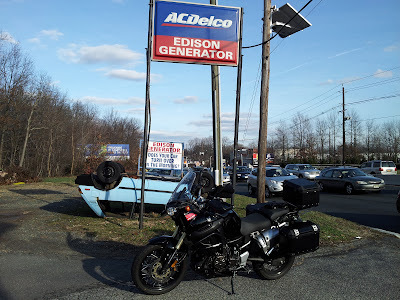 I stopped in front of the NJ National Guard gate briefly to take a single picture and quickly moved on, didn't want to be arrested. I had to be fast, look at the slide I did as I approached the gate. 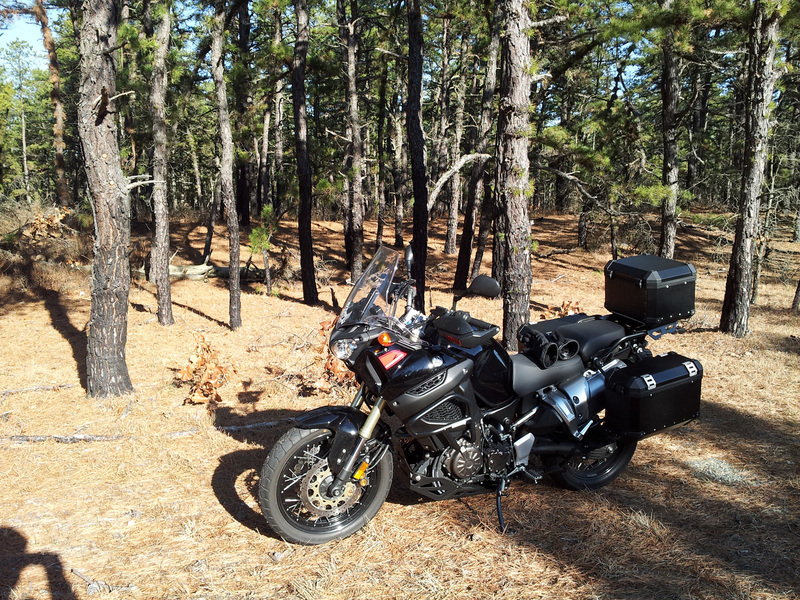 Not really my slide but I did park the bike in the perfect spot. I ended the year riding and started the new year with a ride. On January 1st, I got up early and rode to Manchester to meet a group of riders that were going to ride in the Pine Barrens of New Jersey. 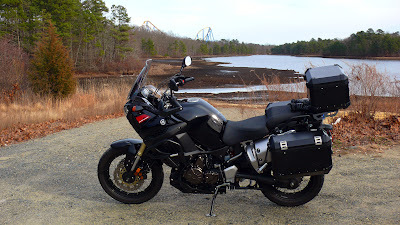 I had heard about this ride on the ADV site from another owner of a Super Ténéré. These guys were planning a real off-road adventure as you can see by the knobbies on the bikes, since I don't have the proper tires, I couldn't go with them. 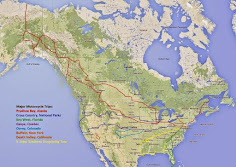 The tires on the blue Super Ténéré are the ones I will be mounting on my bike for the trip to Alaska. We chatted for a while over a cup of coffee and then departed in different directions. I headed south towards my brother's house on mostly empty roads making a stop to take a picture at the 3000 mile mark on the Super Ténéré. 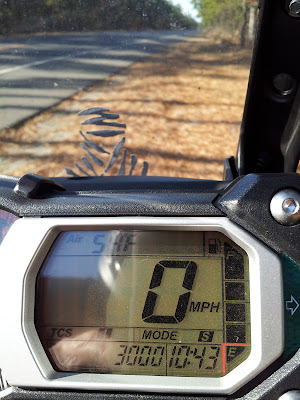 It was a beautiful day, my bike indicating 54 degrees at 10:43am on January 1st. 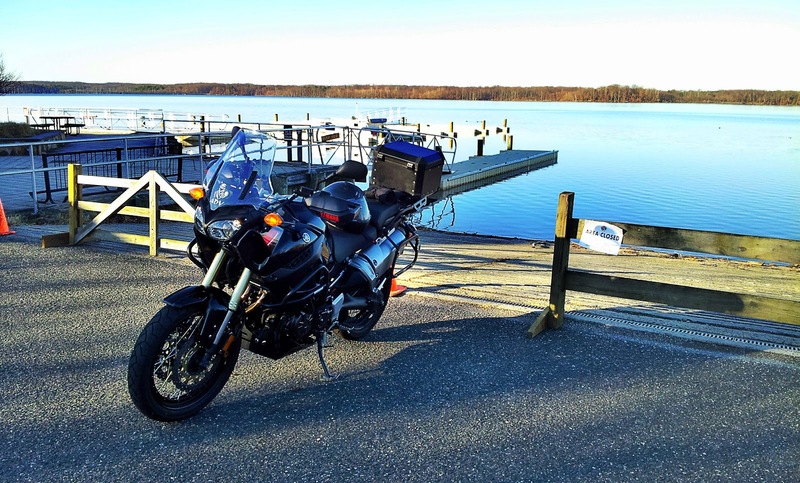 With the Super Ténéré set on Traction Control "TCS 1", engine mode set on "Sport" and a full tank of gas, I hit the empty road and rode at a brisk pace really enjoying my solo morning ride. 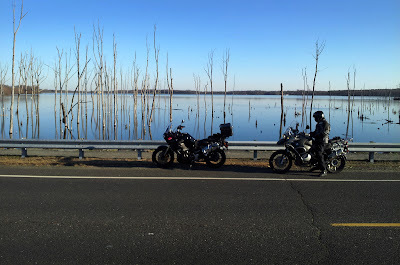 I rode with my brother most of the day going briefly into Pennsylvania. 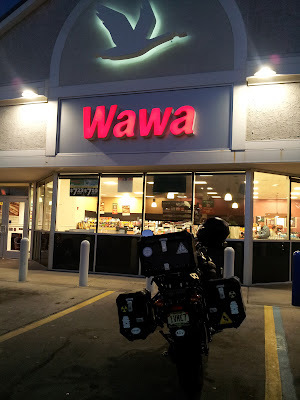 Later in the afternoon we split up, I made one final stop on the way home at a Wawa for a warm cup of coffee and a Blueberry Muffin. Wawa stores are all over New Jersey and they have the best coffee in the state. On January 29th, I rode the back roads of Ocean County passing near the Six Flags Great Adventure Park and visiting a few wineries. I stopped near the park at a nearby lake to take a few pictures of one of the roller coasters. 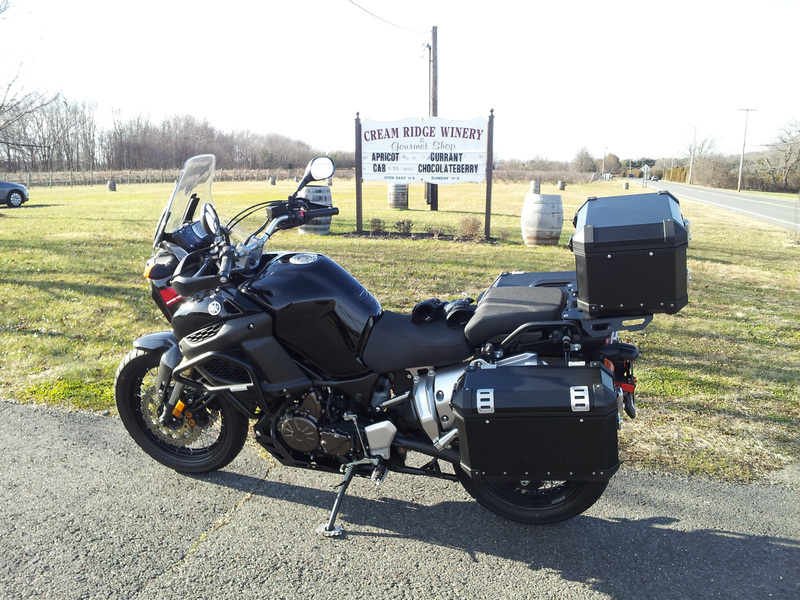 I never knew NJ had so many wineries, there are dozens of small wineries spread across the state. 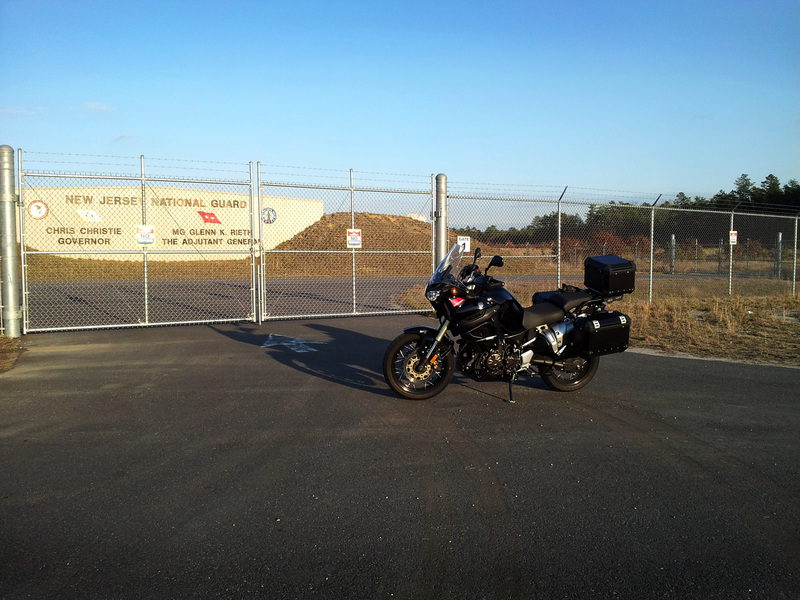 It was another very enjoyable solo ride on a beautiful day. 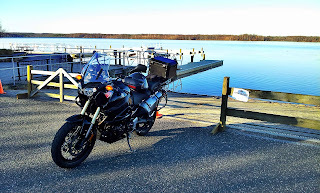 There's something to be said about riding solo, you can go at your own pace, stop whenever you want, take time to enjoy the scenery and take as many pictures as you want without having someone screaming "let's go". I will end my post with pictures of my 51st birthday cake made by my daughter. She knows how her daddy loves motorcycles and dirt bikes, she baked a cake and decorated it with a dirt bike playing in the mud. She picked the right dirt bike too, high ground clearance and two set of wheels mounted with knobby tires. She's a doll and a great pastry chef. Looks like you have been on some great rides in the last few months. Those pictures of the old trees in the lake are really neat. Happy belated birthday. Your daughter sure made a cool cake. Very fitting. I love old decaying forests and this lake has these dying trees in it, pretty amazing. Nice ride photos...all that sunshine! I'd love to ride around the reservoir. Thank you. We have had a very mild winter this year. HAppy Birthday george...better late than never! 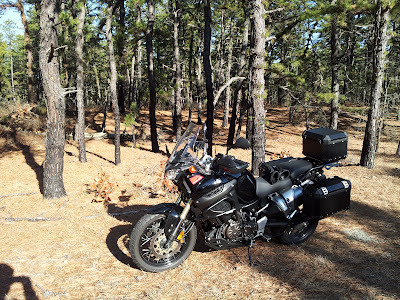 Cake looks great as well as your bike in the pics. I bet you are hanging out for summer. Thanks. I can't wait for summer. 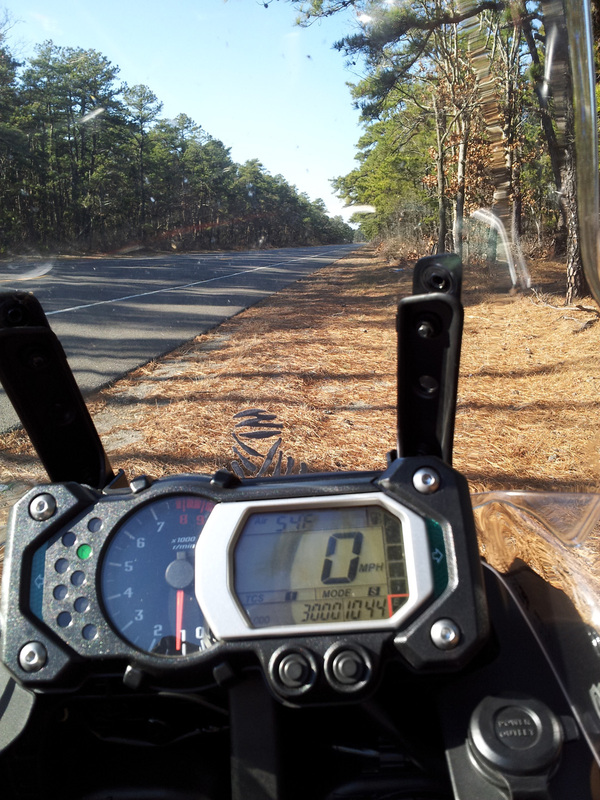 Really, I am jealous, riding in January! And belated happy birthday! Great photos. I like it this way, don't need any snow. Happy belated birthday! I love the spare set of tires/rims she put on there. Great little detail. Had some great weather for some great rides! Thank you, I will show her your comment, she will be happy, she loves to bake.